Shannon Knight heard the diagnosis of cancer from her doctor with disbelief. Radiation didn’t work, and she refused chemotherapy. Her doctor was not supportive of her decision, but she persevered and employed alternative treatments for the stage 4 cancer in her lungs, lymph nodes, and bones. She has now been cancer-free for five years. Ajay Goel, PhD, is a leading cancer researcher who studies the use of curcumin for preventing and treating cancer. In this interview, he reveals how curcumin regresses cancer tumors as well as prevents the disease from occurring or recurring. Anita Moorjani first told her story to the general public in her bestselling book Dying to Be Me. Now, in this excerpt from her new book What if This is Heaven? she reveals the simple reason she healed from the cancer that brought her close to death. Eva Urbaniak, ND, writes about the ingredients and efficacy of the herbal healing tea Essiac. Her article is accompanied by several personal stories from individuals who healed from various kinds of cancer by using Essiac tea. Cheryl Wilkins refused radiation and chemotherapy and opted for alternatives to treat her high-grade malignant histiocytoma; these included the Gonzalez protocol. She is now healthy and following a nutritional maintenance program. Shannon McRae, PhD, a medical intuitive, discusses some reasons that cancer occurs and provides case studies showing that, through lifestyle changes and energy medicine cancer can be healed. Rajiv Parti, MD, asserts that his prostate cancer occurred because of lifestyle factors and that genetics do not play a major role in cancer occurrence. 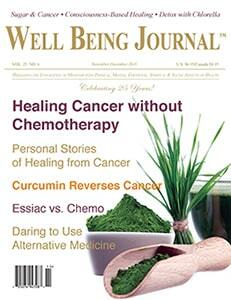 He outlines a new kind of consciousness-based healing to ameliorate cancer and other diseases.